AROMA AT-08 Metal stomp tuner 2-color screen light: green - in tune, white - out of tune S..
AROMA AT-07 Metal stomp tuner 2-color screen light: green - in tune, white - out of tune S.. THE NEW WORLD-STANDARD TUNER HAS ARRIVED The world’s top-selling stage tuner, the BOSS TU-2.. THE LEADING STOMPBOX TUNER, REFINED WITH WAZA EXPERTISE With the TU-3W, BOSS brings Waza Craft mo.. Tiny Tuner This is a smart tiny tuner with the Skyline shape, with fast pitch detection technolog..
KORG PB-AD Compact pedal sized guitar/bass tuner that fits in your pedal board. Large bright..
PitchBlack Custom Stunning visibility and pin-point precision, at your feet. 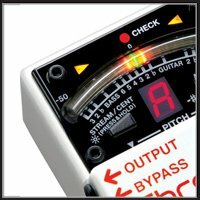 Pedal tuner with ..
KORG PB-MINI Small size, huge visibility! A compact pedal tuner that's ideal for any effec..
Space Saving Tuner Pedaltrain SST Chromatic Tuner is Pedaltrain's unique take on the essentia..
PolyTune 2 Mini Pitch Black The first PolyTune Noir raised the bar for how über-cool a tu..
PolyTune 2 Positively PolyTune The original PolyTune rocked the world. It forever changed the ..
PolyTune 3 Ultra-compact polyphonic tuner gives you fast, accurate tuning and a high-quality t..